The making of untruthful or inaccurate statements may result in criminal charges where it is proved that you made the statements with the intention of defrauding another person. 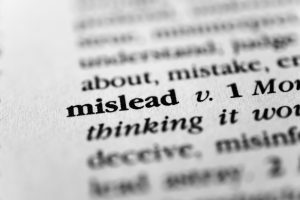 A statement will be held to be false or misleading where it is capable of influencing another person. They may be made orally or in writing. Being charged with a fraud offence is an understandably upsetting and stressful experience; however our expert defence team can help ease the burden by fighting hard to protect your rights. If you believe that you are innocent, you may wish to enter a plea of ‘not guilty’ and enlist our criminal law specialists to fight to protect your rights and interests. Our expert defence team will strive to cast doubt on the prosecution case by showing that the ‘essential elements’ of the offence have not been made out. If the prosecution is unable to prove each of these three elements beyond a reasonable doubt, you will be found ‘not guilty’ of the offence. Should you wish to fight the matter in court, our senior lawyers will give you the best possible defence against the charges by preparing a strong defence case in which all favourable evidence and possible defences are raised. Where you were threatened or coerced into making the statement (duress). We guarantee that you will be represented at all major court dates by one of our outstanding senior lawyers, who have extensive experience fighting and winning fraud matters. This means that you will proceed straight to sentencing, where the magistrate determines the type of penalty that you will receive. In some cases, pleading guilty early on can be beneficial as it will show the court that you have accepted responsibility for your actions. Generally, this will result in the court imposing a less onerous penalty than that which you would have received if you had been found guilty after a defended hearing. However, before pleading guilty to this offence, it is advised that you speak to one of our experienced criminal lawyers, who will be able to advise whether there is any way to fight the charges and avoid a conviction. You should also be aware of the maximum penalty that may apply, which is 5 years imprisonment. Generally, this matter will be heard in the Local Court before a magistrate, where the maximum penalty is 2 years imprisonment. Our expert lawyers can also assist you in avoiding a harsh penalty under the law by preparing and presenting persuasive sentencing submissions which emphasise the need for a more lenient penalty. At Sydney Criminal Lawyers® we are proud of our proven track record of consistently obtaining outstanding results in fraud cases – no matter how serious the allegations are.